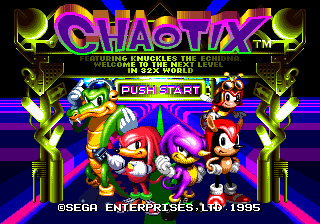 Knuckles' Chaotix prototype 0202 for the Sega 32X was released by drx during the February 23rd, 2008 proto release. Its compile date is Feb 07, 1995. This is the first version to have a title screen with a floor similar to final. Special stage layouts and limits have been completed and are the same as in the final. Game over from going over 10:00 in an act or having -900 rings are enabled. The "Sega" screen has an accompanying sound. This is not present in any of the other protos or the final. However, the sound was changed in the final but never used. Its SFX I.D. in the final and in this proto is 6B.